One of my favorite things is plaid...on anything. It's just so easy to style and literally goes with everything. The print mixing abilities are endless and layering possibilities are the ultimate for fall and winter style. I must say though, sometimes plaid speaks for itself and looks just as fabulous and effortless standing alone with a favorite pair of denim, ankle boots, fun accessories and a basic tote. That was my mindset when I was styling this top. I tend to over think outfits from time to time and going back to simple basic styles like this one is a sure way to feel comfortable and stylish without much thought. Life can get insanely busy and calendar complicated. We are always in a rush with the kids, work, dinner, errands and all the added appointments/commitments in between. It's refreshing to be able to put together a style that is timeless and appropriate for a busy week or even a laid back weekend. This one just works and I fully intend on repeating and swapping out similar items to replicate the causal fall look. Wow those pearls added a touch of elegance to this casual but stylish look!!! But I love the pearls with plaid. Definitely an interesting pair, and you pull it off well!! 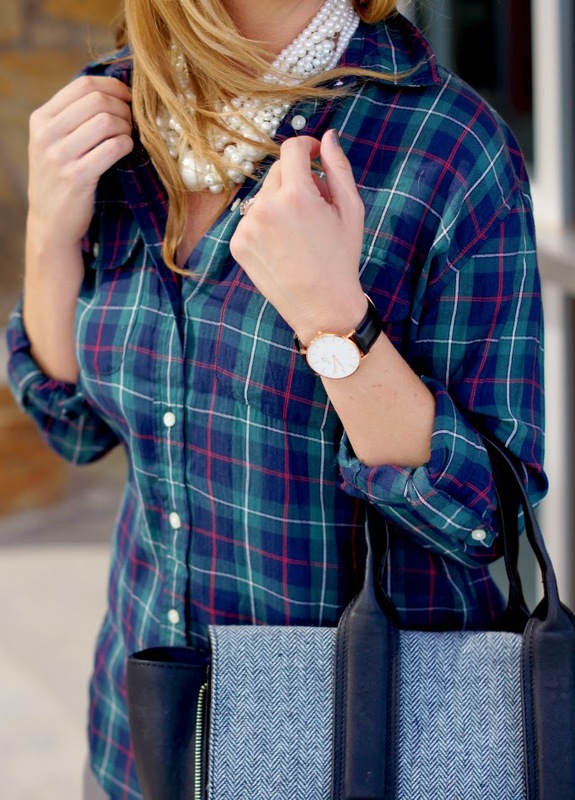 Pearls and Plaid are one of my favorite looks in the fall. I think your plaid shirt goes really well with those pearls as the buttons give off a pearly look in your photos. Loving this look! I love that necklace and it looks great against the plaid!! A perfect example of how a simple classic look can be so special. Love this look and this tote is gorgeous. This is such a great look! Easy going , but still so stylish. I love the pearls, and those grey booties are awesome. 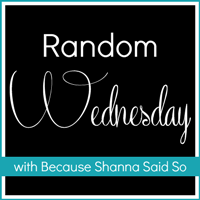 Thanks for hosting the link up Shanna! Loving the colors of your plaid top! Great look! I love plaid too! It's so classic and fun at the same time. Oooh - those necklaces!! 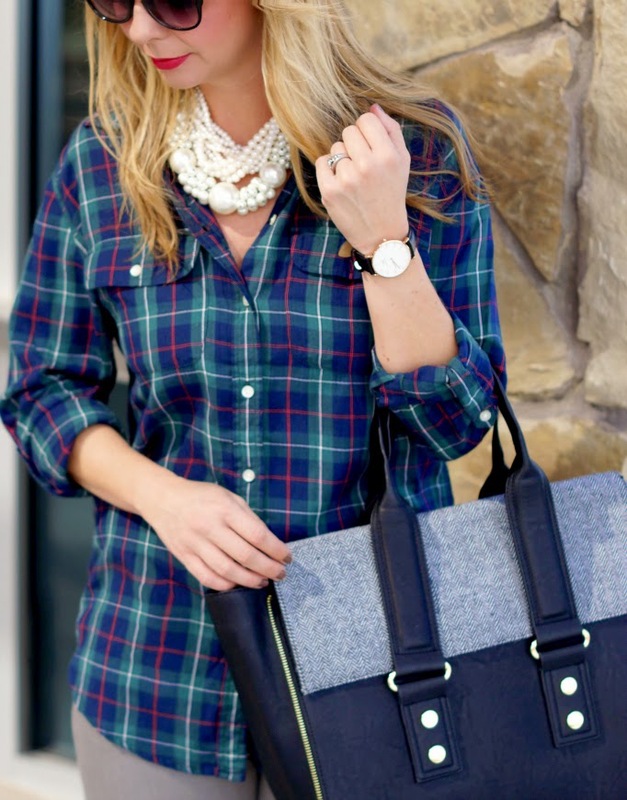 I love all the pearls mixed with the plaid. Those pearls are fab! They are the perfect touch for this look! Obsessed with that chunky pearl necklace!! It is so perfect with the plaid! Gorgeous as usual! Loved the sneak peek of this on insta and I love the whole look even more! The grey jeans are perfect with your plaid. So true about plaid...great for layering, great for pattern mixing. And of course, you know I love the pearls!! That plaid is absolutely perfect and I'm so in love with your bag...great look! I love love love plaid. That's a great one! I like it paired with the gray too, it gives it a little edge. I just don't know how you do it all! You always look so pretty and put together and you juggle so much! I agree. I love a good plaid top because you can wear it with so many things! Love yours, you look fabulous! I love that you chose grey skinnies and booties to pair with your plaid shirt. So unexpected and chic! This a very functional look that doesn't sacrifice style for comfort! My kind of weekend look! DANG GINA (is it you who says that too...lol?). Why do those jeans have to be old? They look SO good on you!!! Plaid is one of my favorite staples for fall/winter! Lookin' good girl. 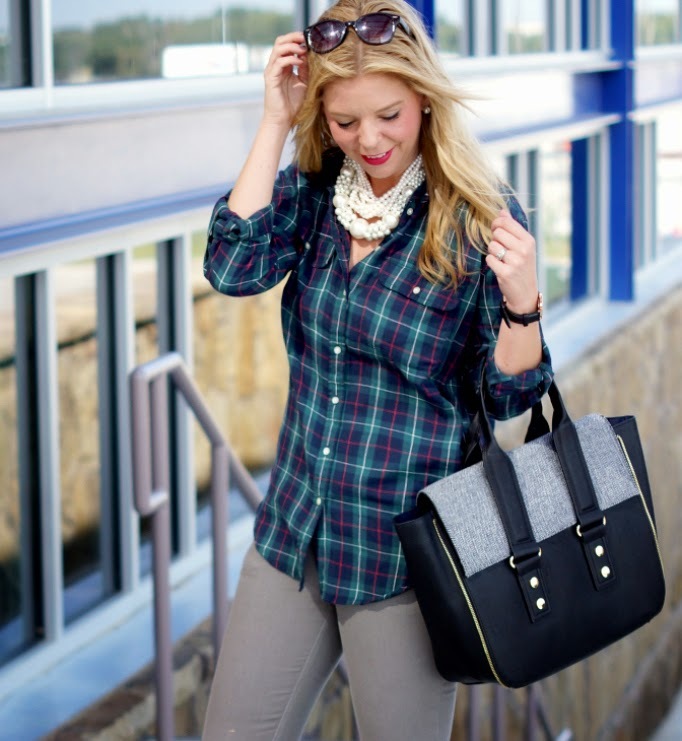 I love the plaid with those pants- such a great fall outfit! Love the grey denim!! Perfect with your booties. Love the bag. Just snagged it on Macys.com for $82! I'll be linking up later...gotta go take my pics. love this combo, the necklace(s) are beautiful! I love the pearls with this outfit! They add a great touch of glam to this outfit! Love the bag and those booties! I can't wait until it gets cool enough here to break out my plaid and booties! I really don't think it is possible to have enough plaid in your wardrobe! I am like, oh yes I already have a red and navy one... but how about green now?! Haha it's a problem. You look fantastic! I love this plaid, the colors are so good! That tote and necklace are amazing. Great inspiration!! I love juxtaposition of vibes, so button down with pearls is right up my alley--can't wait to try it out myself!